The failure of the Great Leap Forward (1958-62) weakened Mao's position considerably in the Communist Party as factions began to form against him.  His sense that the party was shunting him aside probably lies behind his call for a Great Revolution to Create a Proletarian Culture, or Cultural Revolution for short. But Mao also genuinely feared that China was slipping in an inegalitarian direction and he would not stand by while a new elite took over the party and subverted the revolution. To Mao the revolution had to be a permanent process, constantly kept alive through unending class struggle. Hidden enemies in the party and intellectual circles had to be identified and removed. 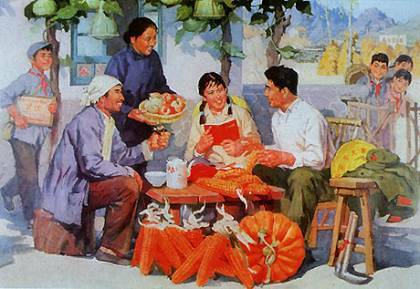 Conceived of as a "revolution to touch people’s souls," the aim of the Cultural Revolution was to attack the Four Olds-- old ideas, old culture, old customs, and old habits--in order to bring the areas of education, art and literature in line with Communist ideology. Anything that was suspected of being feudal or bourgeois was to be destroyed. Jiang Qing, Mao's wife, dominated cultural productions during this period. The ideas she espoused through eight "Model Operas" were applied to all areas of the arts. These operas were performed continuously, and attendance was mandatory. Proletarian heroes and heroines were the main characters in each. 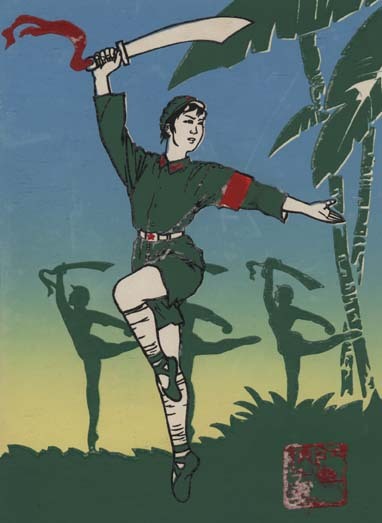 To the left is an advertisement for the opera, "The Red Women's Army," a story about women from south China being organized to fight for a new and equal China. Note the use of ballet shoes and postures. Jiang Qing emphasized "Three Stresses" as the guiding principle behind these operas. Based on the way that the figures are arranged, can you guess to what the "Three Stresses" refers? What are some of the groups represented by the figures in the poster below? Can you guess what is happening in this scene? 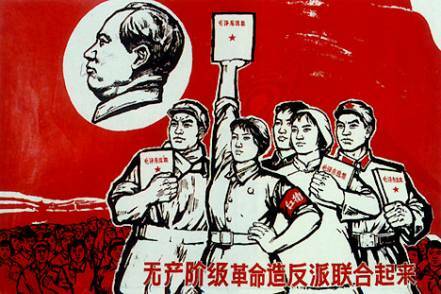 One of Mao's famous quotes was "Women hold up half the sky." How has the artist differentiated between men and women in this poster? In June 1966 middle schools and universities throughout the country closed down as students devoted all their time to Red Guard activities. Millions of these young students were encouraged to attack "counterrevolutionaries" and criticize those in the party who appeared to have deviated from Maoist thought. 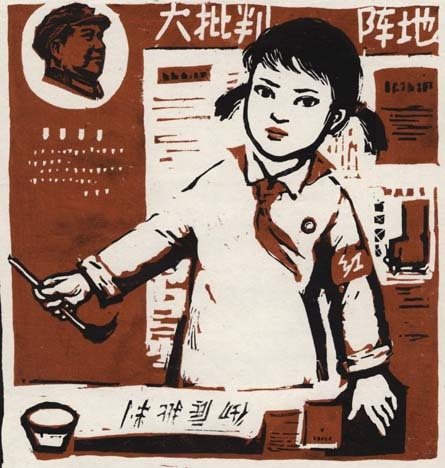 Below is a painting of a young "Red Guard" participating in the campaign. The big characters on the board read "Field for Criticism." 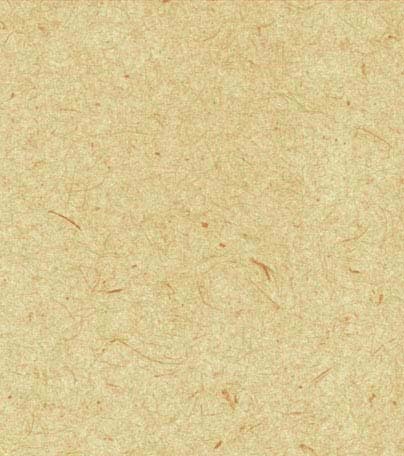 The head of Mao Zedong appears in the upper left corner. Why do you think the artist chose to include Mao's image in this poster? Why do you think the artist chose this particular color scheme?